Adventure takes many roads, and if you’re lucky, it takes you to trout streams, too! If you’re really lucky, you’ll get to share it with your children. Fathers often dream of big adventure with their kids, journeys that take them far from home while bringing them closer together. For many of us, though, work and obligations pile on, and before we know it, the child is grown. Outdoor writer and dedicated Southern trout fanatic Jeff Samsel is not letting that happen. On July 20, he and his 10-year-old son Asher will embark on a three and a half week long expedition that is sure to provide high adventure and plenty of memories. The Samsels are living the dream: throwing rods in the car and heading west, intent on exploring legendary trout waters together. Father Samsel is doing it right, too, by plotting destinations but leaving the timing loose. “Our route is far from exact,” the elder Samsel said. He’s fished the scenic trout streams of the Appalachian Mountains around his Clarkesville, Ga., home for more than two decades, and visited many of the most famous trout waters in the country, but he designed this trip to focus on trout streams and rivers of the northwest. Their first stop, however, is an Arkansas stream that’s near and dear to his heart. 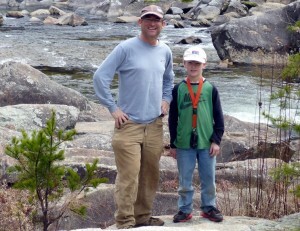 Asher is the second Samsel son to accompany his father on fishing trips. Nathaniel, now 17, tagged along with Dad many times through the years, and often returned home to share with Asher the stories and pictures of the giant trout that swim in Dry Run Creek, a special regulation stream for anglers under the age of 16 and the handicapped. Many of the Samsels’ Trout Trek stops are special regulation areas. Instead of fly fishing these mostly barbless hook areas, though, the pair will be fishing spinning rigs armed with barbless-hook lures designed for these waters by Rebel Lure Company. With a little ingenuity (and a pair of needle nose pliers), though, they also will be replacing regular treble hooks with the barbless variety for lures that don’t come “regulation ready” straight from the factory. After Dry Run, the father-and-son head to Cabela’s worldwide headquarters in Sidney, NE, to gather equipment for the trip, and then they’re off to Deadwood, SD, to fish the rugged trout waters of the Black Hills. After Deadwood, they point the car west to make a big loop that takes them to the Olympic Peninsula in Washington and ends in Laramie, WY. Samsel estimates to travel nearly 8,000 miles from start to finish. And that’s what adventure is all about.